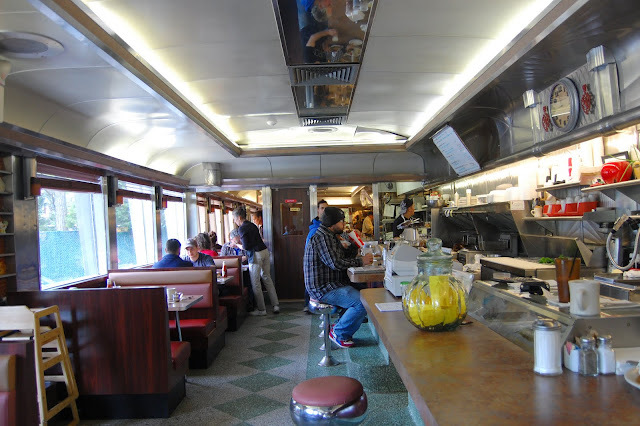 As with other excursions on our recent trip to Boston/Winthrop Massachusetts we focused on places we had always wanted to go as well as places we had seen on a recent Boston themed episode of Anthony Bourdain's No Reservations show. Lynn and I had passed Bell Isle Seafood many times but had balked about stopping there because we were on route somewhere else, didn't have the time, the place wasn't open when we were in the vicinity and so on. We were always intrigued by it's rustic exterior and dramatic positioning in East Boston just outside of the Winthrop, Massachusetts community where planes fly just a few hundred feet over the place right before touchdown at Logan Airport. This last time we made a point of eating there for lunch. Our first surprise was how tiny the place was. There is seating but the popularity of the place and our timing (getting there around 12:40) ruled out a reasonable chance for us to grab a seat (our son in law and grand children accompanied us as well). We wisely opted for take out. Unlike a lot of seafood shack type places BIS had some healthy alternatives to the usual great but calorie rich fried seafood; for instance, I ordered seared tuna and most dishes could be prepared broiled as well as fried so you don't have to fall off the wagon with your diet. Lynn got what was easily the best lobster roll she ever had; it had huge chunks of buttery lobster and the roll was minimal (as it should be but rarely is; even here on Long Island). Despite the greatness of the food, uniqueness of the location and so on going to Bell Isle can be a bit of an ordeal. First off, it is a tough location in that there is not much in the way of legal parking (however, people park on the bridge-despite it being technically illegal). Also, the small space can generate some stress in people who are impatient (especially around the peak of lunchtime) and/or confused about who has been helped and so on (I imagine calling in an order is not a bad idea). Such are the pitfalls of visiting a "cult" eatery. Small complaints on the whole; the great food and selection at Bell Isle make this truly worth the trouble. 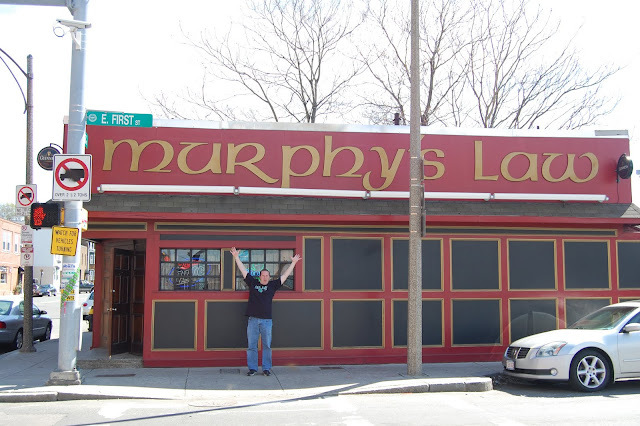 Inspired greatly by Anthony Bourdain's recent "No Reservations" special about Boston and outlying areas my son in law David and I went deep into South Boston to check out a couple of legendary neighborhood bars on a recent sunny Friday afternoon. One was the justifiably famous Murphy's Law on Summer Street. Interestingly enough, we were the only people in the bar even though it was well into the afternoon on a Friday in Boston. This kind of thing makes it hard to take the tempature of a place but we were glad to have a couple of shots of Irish whiskey and we walked around the surprisingly stylish South Boston neighborhoods to clear our heads and soak in some of the rare sunny weather during May in the northeast. A nice bit of trivia is that key parts of the film Gone Baby Gone were shot here and a framed poster is prominent as you enter the space. Ginny Selvaggio, the heroine of Jael McHenry's debut novel The Kitchen Daughter (Gallery Books) has Asperger's Syndrome a "high funtioning" form of autism that usually has a strong component of difficulty with even the most fundamental social interactions. 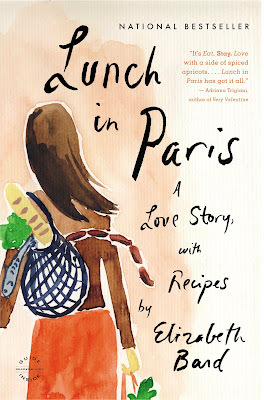 After a tragic accident, Ginny finds herself in a state of confusion and stress which is only remedied when she cooks. The ritual of cooking particularly cooking recipes from her own familial experiences not only assuages her anxieties it creates a kind of supernatural aura in her life that is both mesmerizing and comforting to her bruised psyche. Ms. McHenry was nice enough to correspond about her work with Mark and Lynn where she mused about Ginny, her own likes with regard to food and drink and who might play Ginny if and when The Kitchen Daughter makes it to the big or small screen. M & L: How did the striking cover design come about? JM: "It’s amazing, isn’t it? I can’t take any credit for it whatsoever. Early on in the process my editor had asked me for ideas, and I sent her some very spare, minimalist photos of kitchen things – and then the art department came back with this beautiful, warm, evocative design that was so much better than anything I’d imagined. All I had to do was say yes. I love that it makes you look twice. " M &L It seems that cooking and eating are two wholly different experiences for Ginny; why do you think that is? JM: "I think it’s pretty unusual to separate the two so clearly – I, for one, really love both – but for her, it makes perfect sense. The act of cooking is very reassuring for her, going through the steps, following the instructions. She’s not all that interested in the result, other than it turning out “right.” It’s about the process and how it makes her feel." M & L: The book would have certainly been a moving and interesting work without the element of the character's Aspergers-Did you contemplate leaving this out at any point? JM: "I did, midway through the process. I was lucky enough to have several agents interested in representing the manuscript, and more than one spoke up and said they thought it’d be an easier sell without it. So I took some time to think about it, and in the end, I decided I just wasn’t okay with letting go of that aspect of the story. It was important to me to keep it, and I’m really glad I did." M & L: Have you heard from individuals with Aspergers (or their families?) What has their reaction been? JM: "That’s one of my favorite parts of having the book out there in the world – hearing from readers. And I’ve been blown away by the positive response from people who have friends or family members with Asperger’s, and Aspies themselves. Everyone’s experience of Asperger’s is different – there are an infinite number of places on the spectrum where people can land, and if you’ve met one person with Asperger’s, you’ve met one person with Asperger’s – but so many people have written to say that Ginny reminded them of the Aspie in their life, or that they felt I captured some of that perspective in a way they’d never seen before. It’s really wonderful. " M & L: Do you ever think about Ginny? JM: "Oh gosh, all the time. 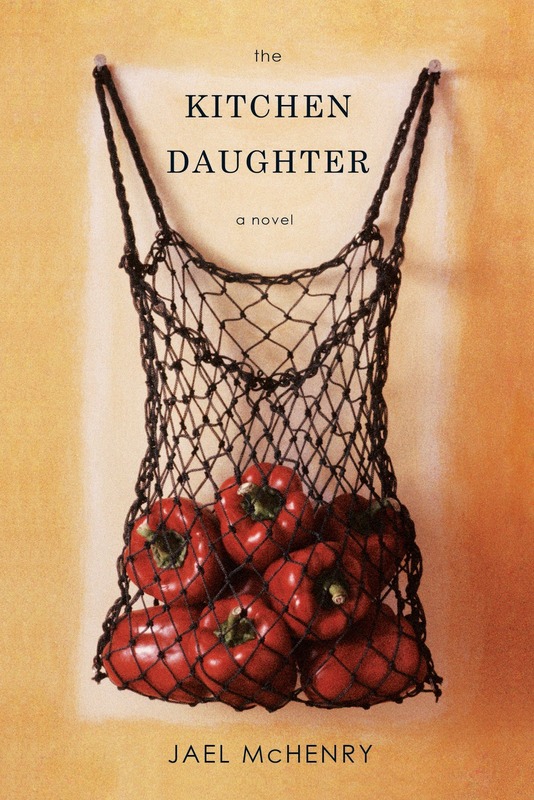 A lot of readers have been asking whether I’ll write a sequel to The Kitchen Daughter, and I don’t have any plans to do it right away, but I have definitely been thinking about where Ginny’s story would go next. I’m very attached to her!" M & L: Between the Aspergers element of the novel and the supernatural elements of the book did you ever worry that you were juggling too many elements for one book? JM: "You name it, I’ve worried about it! So that was definitely a concern. I felt like the ghosts, the Asperger’s, and the cooking were all essential elements of the story, and I tried to keep them all in balance. That took a lot of writing and rewriting, but in the finished product I think they all fit in where they should. " M& L: If KD is turned into a television or feature film do you have an idea of who might play Ginny? JM: "As I was writing, I was picturing the actress Zoe Kazan, who I’d seen on Broadway shortly before I started working on the book. And she’d be a great choice. 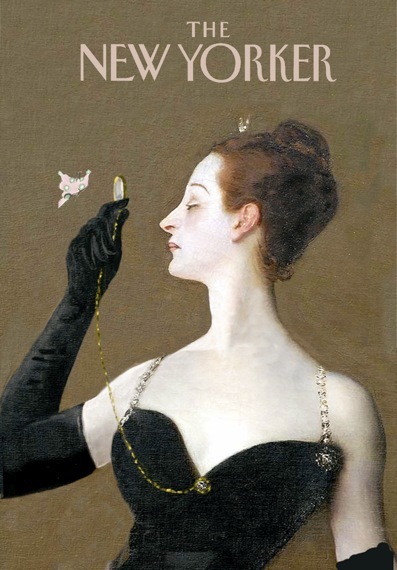 But I’d love it even more if the producers would explore the idea of having a young woman with Asperger’s play the role. Heather Kuzmich, who was a contestant on “America’s Next Top Model” a few years back, would actually be just about the right age. Of course it’s highly unlikely that I’ll have much input if the book is optioned for film or TV, but it’s also impossible not to speculate and wonder at least a little!" M&L: Your bio makes mention of the fact that you made it to the semi finals in the Jeopardy College tournament-What was that like? JM: "Crazy! I was a senior in college, and the chances of making it were so incredibly slim, it was absolutely unbelievable when I made the cut to appear on the show. (I don’t know which is less statistically likely, getting a novel published or getting on College Jeopardy!, but they’re both nearly impossible, so I’ve been very very lucky twice now.) And it was just a complete whirlwind. Flying to L.A., taping two weeks of shows in two days, meeting Alex, all that craziness. And I didn’t win, but I made a killing in consolation prizes. Klondike bars, electric toothbrushes, Hooked on Phonics, you name it. " M &L: Do you have a favorite food? Cocktail? JM: "My favorite food is probably potato puffs – you mix cream puff dough with mashed potatoes, then drop spoonfuls into hot oil to fry them. Cocktailwise, I think it’s hard to beat a good Manhattan." Just a quick line about an article from the New Yorker Lynn found particularly interesting about the marketing of snacks by major corporations like Pepsi. To read it click here. We had read about the Long Island City eatery M. Wells from a piece in Time Out NY and were instantly intrigued. One recent, foggy Sunday morning we made the 60 mile trip to the diner at which point we parked nearby and waited outside with a cadre of apparent hipsters for our name to be called. Once we got in, we quickly realized that the wait was most definitely worth it. Lynn had a great and delicate fish and chips entree which was wrapped in the pink newspaper of the Financial Times. I had tartar which managed to have just the right amount of heft and flavor. Most unusual of all were the oysters we had which were topped with a white wine/espresso foam which gave them a sweet and briny kick. Our brunch cocktails were decadent treats on a crummy day. I don't remember them all that well but mine was entitled a "Slap Shot" and had Canadian Club in it; a tribute no doubt to the national sport of Canadian Chef Hugue Dufor. It was fascinating to watch Chef Dufour work with a kind of relaxed intensity; it reminded me a little bit of the energy Miles Davis had when he performed; confident but wound up tight at the same time. It was not a complete great experience, we had several servers some of which were more engaged than others and the hostess seemed distracted and demonstrated annoyance if we checked with her about where we were with regard to our wait (mainly because we saw parties seated ahead of us who arrived after we did). If this place can raise it's level of service to the food then MW may attain legendary status (at least for now). 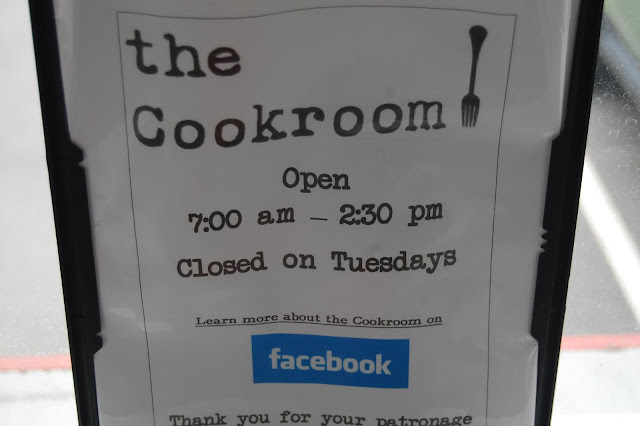 Is the Cook Room in Middle Island, NY the first "Gastro Diner" on Long Island? The Middle Island community is a rather non-descript, fairly unfashionable part of Long Island well known for its busy Wal-Mart. Imagine Mark and Lynn's surprise when an eclectic, dare we say hip diner sprung up recently smack in the middle of this community. The Cook Room has quickly become our favorite place to have a late breakfast on the weekends due to its eclectic menu which features the usual breakfast/brunch favorites like Omelets, Pancakes, Hash Browns, Turkey Buger and so on. We have been twice and the artichoke omelet with roasted red peppers and provolone is my current favorite There is nothing fancy about the food here, no pretense but there is a sense of hip modesty in the details here that is quite becoming (my Diet Coke was served up in a mason jar and John Lennon and Pink Floyd provided the soundtrack for our brunch). Much of this spirit is surely the result of Lauren and Jim a young couple who are running this restarunt We have also just dined at M. Wells in equally unhip Long Island City and it has taken a rather pedestrian old diner space and transformed it into one of the cool places of the moment in the 5 burroughs. Perhaps a kind of "gastro diner" trend is truly starting to take hold in the area. Thanks to the Cook Room, Mark and Lynn don't have to hoof it to Long Island City every time to get outstanding, creative diner food. Barefoot winemaker Jennifer Wall just continues to impress with their line of excellent, reasonably priced wines. This time out, however, they have released a lovely and celebratory sparkling wine called Barefoot Bubbly Brut Cuvee. The timing of this is highly appropriate as Mother's Day is just around the corner and it is a perfect complement to making brunch for mom, or, on a more decadent note, having breakfast in bed for mom. The Barefoot Bubbly is a Chardonnay Champagne which has at its base a great palate of fruit flavors, mainly kiwi and peach. This fruit flavor lends itself to a nice cocktail called a "momosa" which is a combination of fruit, orange juice and of course the Barefoot Bubbly. This versatile sparkling wine should be great for summer as well as it's comfortable price point and accessibility should make Barefoot Bubbly a great daily drink.